You can drag the 1D spectrum (and, separately, the integral curves) up and down. You can drag the four borders of any 2D plot, or the left and right limits of a 1D plot, and change the plot size. In the case of the stacked plot, when you drag the right margin, you create a slope. If you press the Shift key (or Caps Lock) when clicking, the movements are restricted in steps of 10 screen units. You can drag the scales at the bottom and at the right. In a 2D plot, the scale initially coincides with the margin of the plot. The rule is: drag under the scale, the scale moves; otherwise the margin moves. You cannot drag the integrals. Dragging the mouse elsewhere creates a selection (gray on the screen), upon which you can apply an action chosen from the ‘Tools’ menu. A double click adjusts the amplification so that the highest peak fits into the plot. The triple click is equivalent to the command ‘View / Full’. Some operations require a mark, that is a red line pointing to a chosen frequency. You can create any number of marks at any time and drag them with the mouse. To create or delete marks you combine the click of the mouse either with the ‘Command’ (vertical marks) or with ‘Option’ (horizontal marks) key. You can press Command and Option simultaneously. Marks are automatically deleted when, after a panning or zoom operation, they fall into an hidden region. 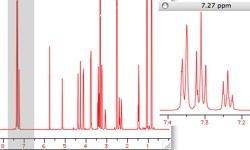 In case of 2D/3D spectra, when there is a single horizontal mark, a trace appears on top of the spectrum. The trace corresponds to the chemical shift of the mark. First you select a region, then choose the tool; in this case the tool is not persistent. This usage is comfortable when you use keyboard shortcuts. First you choose the tool, then select a region; in this case the tool is persistent. If you want to disable a tool only for a few moments, keep pressed the “Shift” key. At the release, the tool will reappear. If, instead, you want to revert to the normal pointer, you can press “Esc”: the latter shortcut is a standard among most applications. At the top of the Tools menu there's a command to open the dashboard. It's a palette containing icons to invoke all tools and other commands. If you close the application with the dashboard open, you will find it at the same position the next time you open iNMR. Pressing a dashboard button is equivalent to pressing the corresponding key on the keyboard. For example you can manipulate the integral curves keeping the 'Alt' key down and hitting the 'Enhance', 'Decrease', 'Up' and 'Down' keys. You can also use 'Ctrl' and 'Shift'. You can choose between two different layouts for the dashboard: vertical or horizontal. Click on the green “zoom” button in the title-bar to switch between the two. The dashboard contains two commands that behave differently from their equivalents contained into the “Process” menu. The automatic baseline correction button skips the dialog, while the FT button also performs signal suppression (provided that the document already contains the necessary parameters).